swedes have long been great whisky drinkers, but a group of spirited single malt lovers has set out to prove that the scandinavian country can also make the amber liquid, not just polish it off. 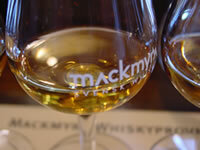 founded in 1999 and operational three years later, the world's northernmost whisky distillery, mackmyra (swedish, english site click here), has attracted hundreds of faithful customers who have invested in their own personal cask of of swedish single malt. the house of khodays, the indian liquor powerhouse of yesteryears, is close to signing a deal to hand over the marketing, distribution and manufacturing rights of its popular indian made foreign liquor (imfl) brands to a strategic ally on a long-term arrangement. valleys company welsh whisky is toasting a new supply deal, which sees its penderyn single malt being sold in sainsbury's english stores for the first time. the agreement with the supermarket chain covers 25 london stores. uruguayans love their state, a bulky but benign creature that owns everything from telephone lines to oil refineries and bottles its own whiskey. but a new leftist government to be sworn in this week can't afford the paternalism of yesteryear and may open the economy to private participation in ways generations of conservative rule could not, analysts said.